This Sunday, we will all be celebrating a very special holiday. Easter Sunday.… filled with the special meaning of Jesus Christ’s resurrection and celebrated with fun, family, friends, games, and as always, candy! 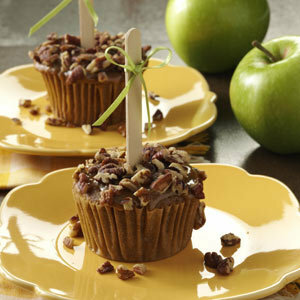 So how can you incorporate Apples in your Easter fun planning? See some creative ideas below. How about an Easter Apple Hunt? Apples are fun and easy to decorate. Add some Apples into your egg hunt by putting stickers of any kind on them, or dip them in caramel and/or chocolate and then add your own candy topping’s to the outside. Have an apple bobbing contest with some prizes to include the whole family! 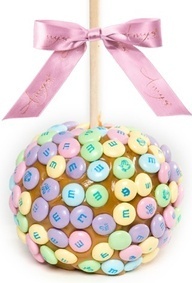 Here is a great idea found on Pinterist, just dip the apple in your favorite caramel and stick on the Easter M&M’s! If you are looking for that perfect idea including your favorite apple variety, see some recipe options below:As you can see from the featured picture above, there are many ways of incorporating fruits into your Easter planning. This “Mr. Fruit Bunny” was found on tasteofhome‘s recipe site at http://www.tasteofhome.com/Recipes/Mr--Fruit-Bunny. How cute and cool is that? What a fun way to spend part of that day with your family, making an Easter Bunny out of all types of fruits! While you enjoy Easter this Sunday, remember the reason for the holiday, the amazing gift from Jesus of forgiveness and salvation. Borton Fruit wishes everyone a wonderful Easter Celebration with Family and Friends. Hopefully you can find a way to add some Healthy Fun to your Day!